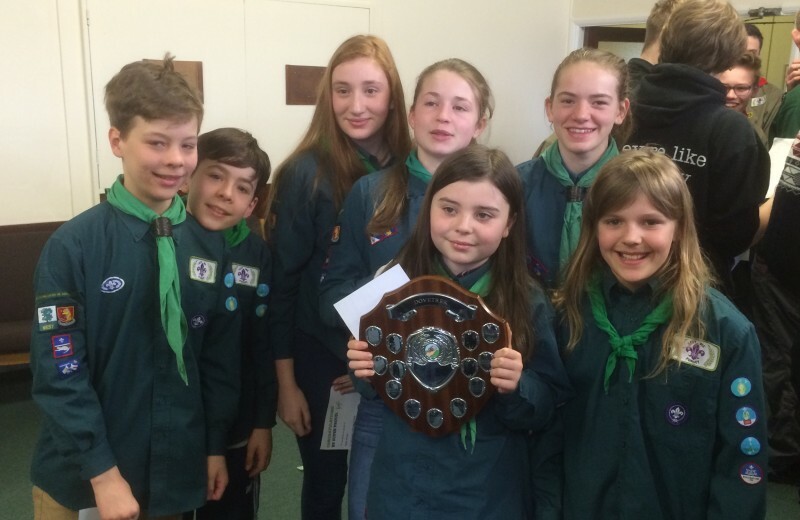 This is the 47th year West Warwickshire Scouts have competed for the Dovetrek trophy. Every year teams of Scouts travel to the Derby dales to spend the day hill walking with Scouts from across the district. Teams, unaccompanied by leaders, have to plan a circular route between 6 checkpoints. They get awarded points for arriving and more points for completing a task at each checkpoint. This year the tasks included; getting over a fence without touching it, making Lego models as fast as they could, archery, knots and dealing with a first aid incident. Navigation is difficult and many teams take wrong turns, making sections that should take 30 minutes last several hours. All the teams carry a GPS tracking device so the organisers know where they are even if the Scouts don’t. Tanworth were the first team to complete the route this year, one of only 5 teams who finished the route within the time limit. When all the scores and times had been calculated and counted the results were Bearly & Snitterfield 2nd & 3rd but Tanworth in Arden 10 points ahead in 1st place. After the event several leaders complimented Tanworth’s team on their behaviour and team work. Tanworth’s team consisted of boys and girls aged from 11 to 14 so for such a disparate group to be able to successfully work together as a team in challenging circumstances is a significant achievement. Congratulations to them all. We’d like to thank all the West Warwickshire leaders for working so hard and putting on such a great event this year.